I have a very rich historical background (as I’m sure most of us do). My country, Trinidad and Tobago, located off the coast of South America, was originally inhabited by native tribes from that American continent. They were known as the Amerindians. Later on, in 1498, my country was settled by Christopher Columbus in the name of the Spanish king and queen. Trinidad remained in Spanish hands until 1797, but it was largely settled by French colonists. Tobago changed hands between the British, French, Dutch, and Courlanders, but eventually ended up in British hands following the second Treaty of Paris (1814). In 1889 the two islands were incorporated into a single crown colony. Trinidad and Tobago obtained its independence from the British Empire in 1962 and became a republic in 1976. Trinidad and Tobago has a very cosmopolitan population because of the many European influences it has had over the years. British rule from 1797 led to an influx of settlers from the United Kingdom and the British colonies of the Eastern Caribbean. English, Scots, Irish, German and Italian families arrived. Under British rule, new estates were created. The cash-cow (a business, investment, or product that provides a steady income or profit) at that time was sugar and many plantation owners sought immigrants from India, China and Africa to meet their labour demand and keep production at its peak. I’ve therefore always been exposed to a mix of races and cultures. This week my friend sent me a link to an article that claimed that this exposure is quite a good thing. BBC reported that mixing with a diverse group of people is good for your brain. I’ve shared the link below if you would like to take a look. It claimed that interacting with different kinds of people nurtures creative thinking. With the advances in technology and the frequency at which information is available, we are constantly bombarded with details. The human mind can only handle so much though, our mental resources are limited. To cope, we adopt mental shortcuts to come up with the fastest, easiest solutions and immediate responses. This can however limit our growth as people. We can mentally grow and break away from automatic thinking by engaging with people who are not ‘just like us’. Interacting with someone from a different nationality, race, culture or age group gives our brain a powerful workout. This happens as the brain has to process complex and unexpected information. Engaging doesn’t have to be face to face either. Other ways to stimulate your thinking include anything from watching foreign films to reading books about someone from a different background. Simply doing something outside the norm of what your brain and social groups are accustomed to is the trick. 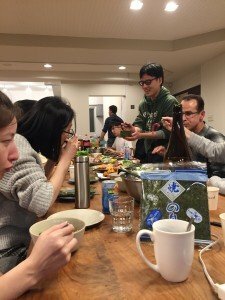 Being in Japan and living in a sharehouse like Oakhouse provides a multitude of opportunities for mental growth. Learning languages, experiencing different cultures, trying new styles of cooking, adapting to a communal environment, watching movies with your housemates that you usually wouldn’t have put on your ‘watch list’ and the list goes on. Hopefully by reading a little bit about this stranger and her background, you feel a little stimulated already! I'm like a chihuahua. Small but fierce and full of energy. I'm generally a positive person and try to make the best of each day.